Memo to neoconservatives: regime change in Iran isn’t in the cards. With ten days to go before Iran’s presidential election, Ayatollah Ali Khamenei, the supreme leader of Iran, and US neoconservatives are on opposite sides of the regime-change question, as one might expect. Here’s the reality of Iran’s presidential vote: there isn’t going to be any regime change, despite Khamenei’s fears and the hopes of right-wingers such as Robert Joseph, a former George W. Bush official. The next president of Iran, whoever he is, will settle into a working relationship with Khamenei, and President Obama will have to deal with the actual Iranian government, do business with it, and seek an accord over Iran’s nuclear program. And, because President Ahmadinejad of Iran has been so belligerent and thus so demonized in the United States, Obama will find it a lot easier to sell a deal to the American public that he makes with a president whose name isn’t Ahmadinejad. Khamenei, widely vilified by outside critics for endorsing the Guardian Council’s decision to ban an Ahmadinejad aide and former President Ali Akbar Hashemi Rafsanjani from running for president, gave an important speech yesterday—with both Rafsanjani and the Ahmadinejad aide, Esfandiar Rahim Mashaei, sitting on the stage with him! Apparently, neither man was so miffed by Guardian Council’s decision that he’d refuse to sit with Khamenei, yet another signal that the Islamic Republic’s political system is staying intact. Iran’s supreme leader, Ayatollah Ali Khamenei, accused foreign and domestic critics Tuesday of attempting to undermine the country’s June 14 presidential election…. Khamenei dismissed these criticisms as misguided plots to undermine Iran’s political system. Tinkering with current policies will not achieve a non-nuclear and democratic Iran. Instead, it is time to “reset” U.S. policy and recognize the need for regime change. This change must come from within Iran and be led by Iranians, but the United States and the international community can provide essential support to encourage and strengthen the opposition inside and outside of Iran. In reality, the NCRI and the PMOI have zero influence and support inside Iran, little backing outside Iran, and rag-tag army of sorts—whose terrorist designation was recently lifted by the United States and which has lucrative ties to former top US officials—that is being shipped out of Iraq by Prime Minister Maliki’s security service. He said the United States would “continue to pursue every effort to have a peaceful resolution” of the dispute. To be successful, the United States will have to make concessions to Iran that it has been unwilling to make so far, including a decision to state forthrightly that, at the end of the talks, Iran will be able to enrich uranium, on its own soil, under tighter international supervision. But at least Kerry is committed to continuing the talks, despite the pressure from the hawks. Talking with Iran, of course, was a key plank in Obama’s 2008 election campaign. 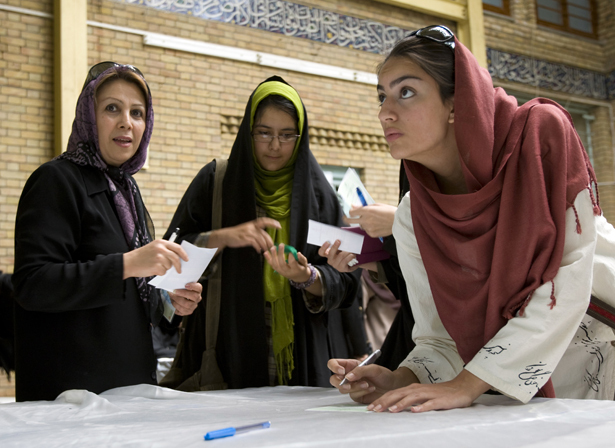 Read more from Bob Dreyfuss on Iran’s critical elections.